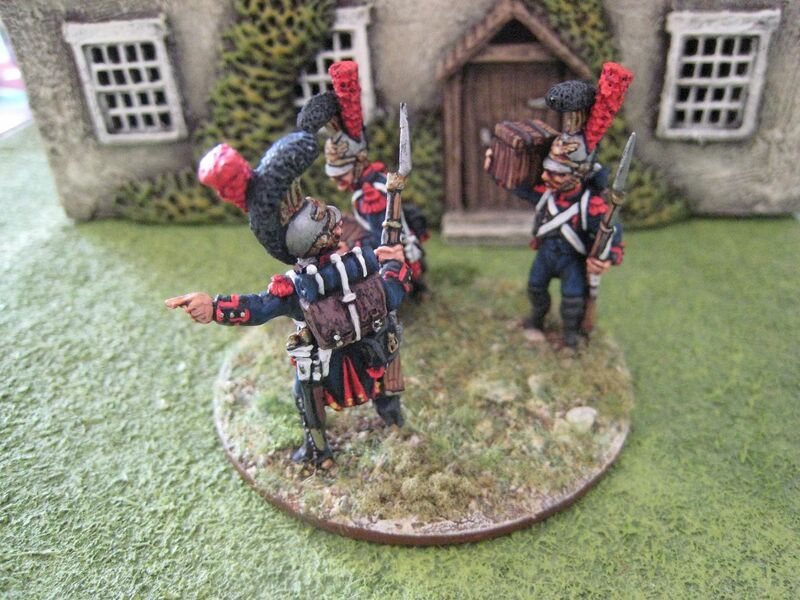 I'm still photographing AWI bits and pieces so here is a small vignette of the engineers of Napoleon's Imperial Guard (or to give them their proper French name, "le génie de la Garde impériale"). A small corps of engineers was created in 1804 as part of the Consular Guard and a 140-odd strong company of sapeurs was added in January 1811 to act as specialist firemen (apparently, according to one source, in response to a bad fire at the Austrain Embassy in Paris which). These troops were initially part of the Old Guard, but as the corps expanded in numbers new companies were assigned to the Young Guard. By 1814 the engineers numbered a complete battalion, of which the first company was in the Old Guard and the second to fourth companies were in the Young Guard. The engineers do not appear to have ever fought together as a regiment. As you'd expect for troops of particular expertise, detachments were used as required. The corps numbered around 600 men at the time of Napoleon's abdication. During the Hundred Days about 200 men were mustered to re-form the unit, of which just over a hundred appear to have been present in the Waterloo campaign under a Major Boissonnet. The uniform was very similar to that worn by the regular army's engineers, save that the latter's shako was replaced by the brass helmet you see here. 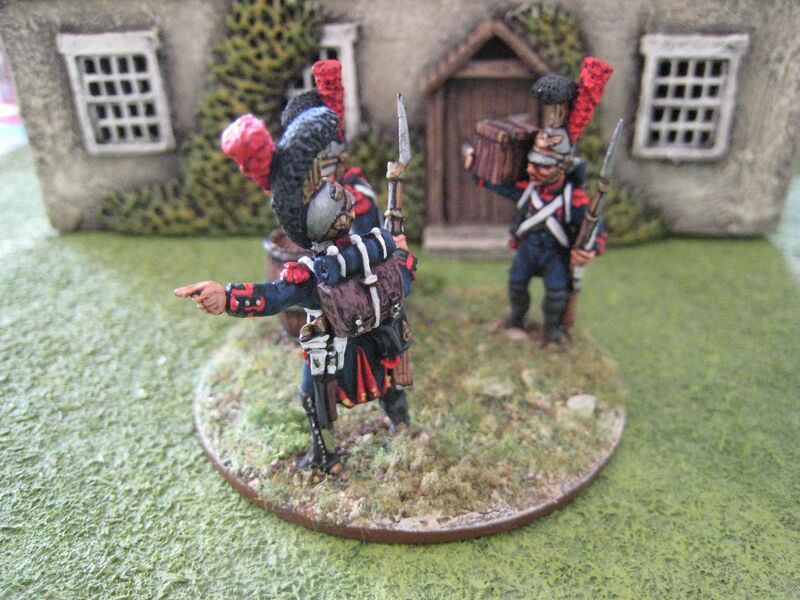 These are large 28mm figures. 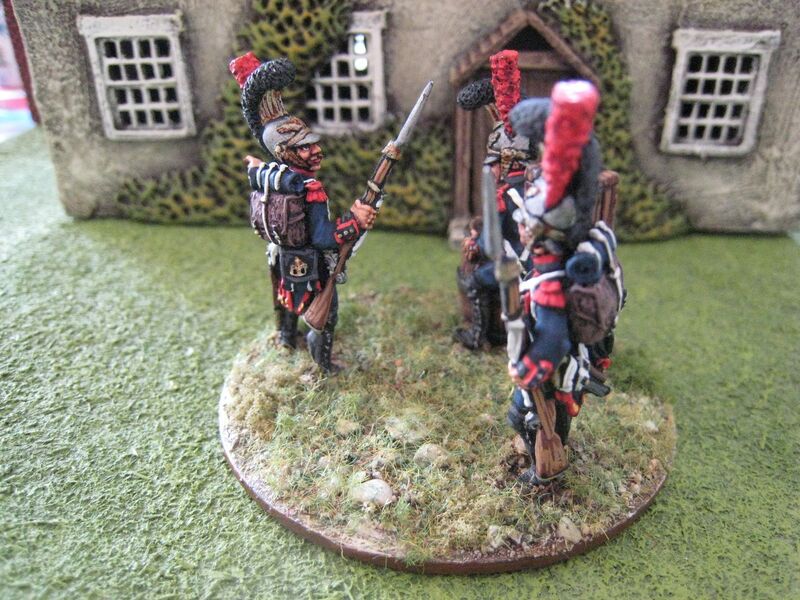 From base to the crest of the helmet is 35mm and they look quite big side by side with Perry and (particularly) Foundry Napoleonic figures. 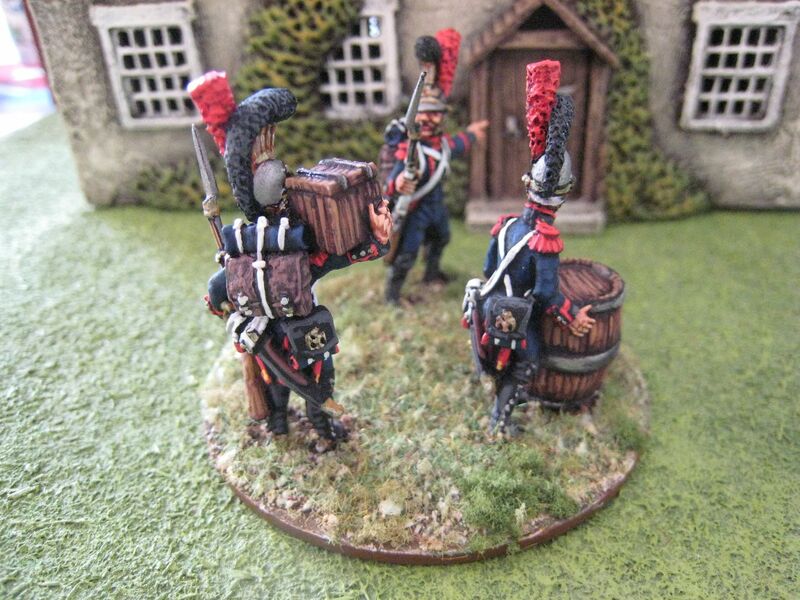 I thought about putting some more boxes and crates or barrels on the base, but then decided that would be too busy and, given the amount of "rear echelon" stuff I have for my French Waterloo army (with much more planned), I wanted to keep the base size of this vignette as small as possible. As with my other Imperial Guard figures (who now have a new label all to themselves) I used the Foundry "French Blue 65" palette with a cheeky final highlight of "Deep Blue 20B". More AWI next, I promise. 3 figures. Painted June 2015. 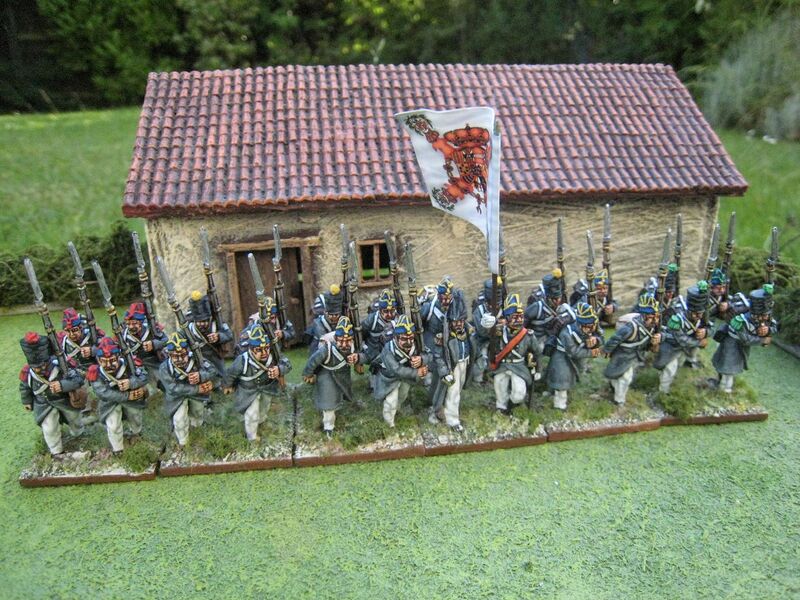 It's been over 2 years since I last posted about the First Carlist War and over 4 years since I last painted Isabelino infantry (and this post has itself been gestating for a couple of weeks while I take and re-take photos; hence the gap in posts). For the past few months I've been making an effort to deal with the leadpile - as a result I have barely bought any new figures during the past year or so, save some boxes of Perry plastic AWI infantry when they were released, the Ewart vignette and a couple of metal AWI packs and some Maori from Empress Miniatures. 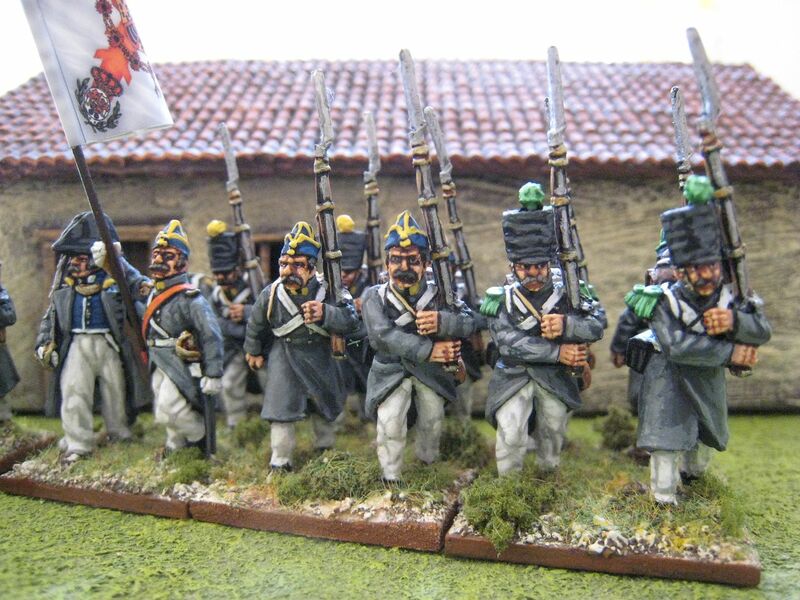 Oh, and some Napoleonics from Gringo 40s that I'm currently getting to grips with. That's certainly saved some money, and as wargaming chum Timmo says "hoarding unpainted figures isn't much of a hobby". 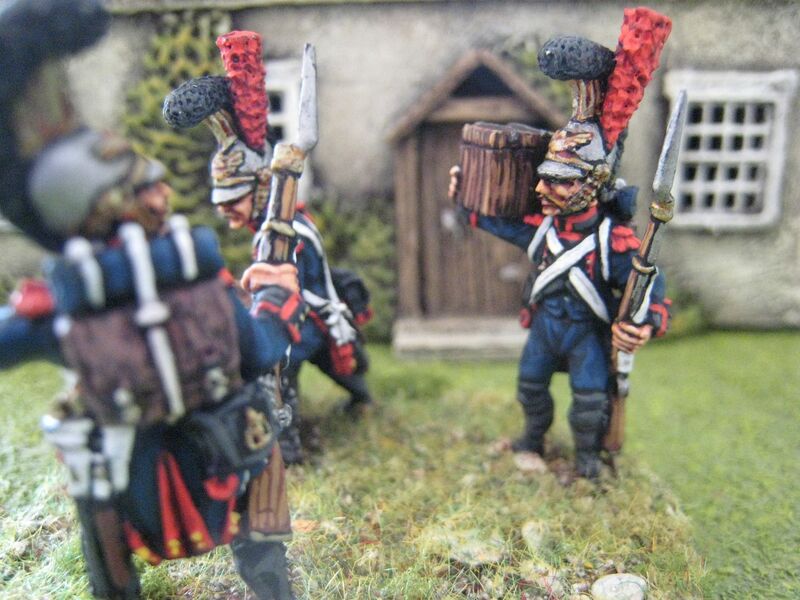 One aim of this year is to become "lead neutral" on a couple of periods, by which I mean having no unpainted units left to paint and a rule that anything new is painted as soon as it is purchased. My First Carlist War leadpile consists of some Valencian troops for the Carlists and some regular cavalry for the Isabelinos, so not a huge amount to get through. 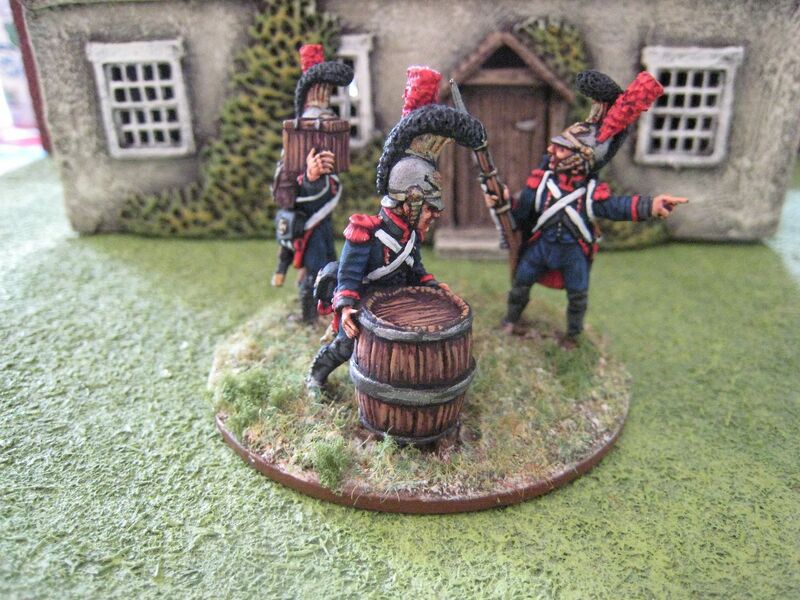 (The other period I'm focussing on is the New Zealand Wars, with about 40-odd figures and a massive 24-pounder to get through.) 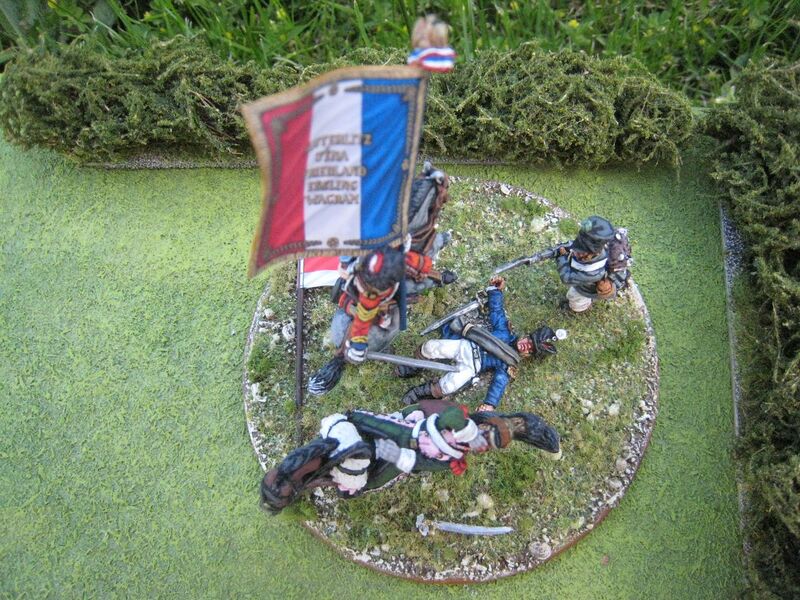 The FCW leadpile also contained enough figures for another Isabelino infantry battalion, and this is it. 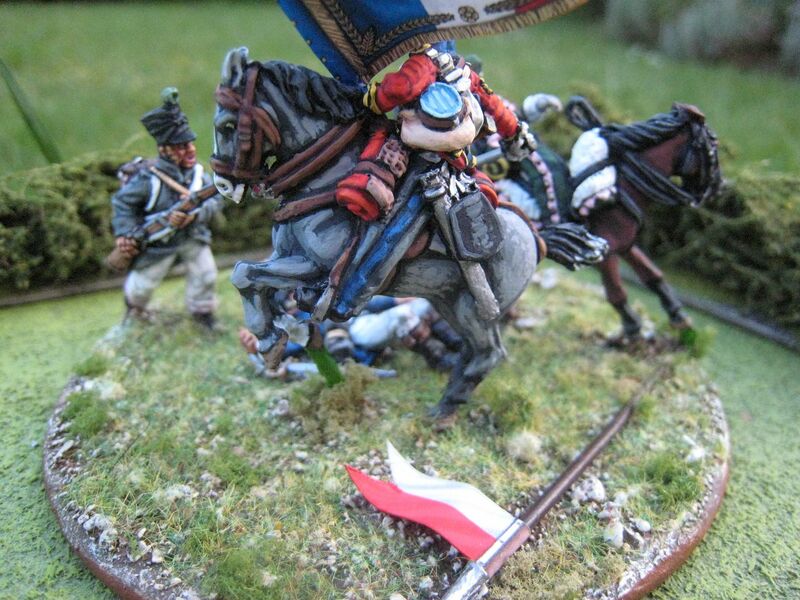 The regular army battalions I chose to paint are determined solely by the flags that are available from Adolfo Ramos. 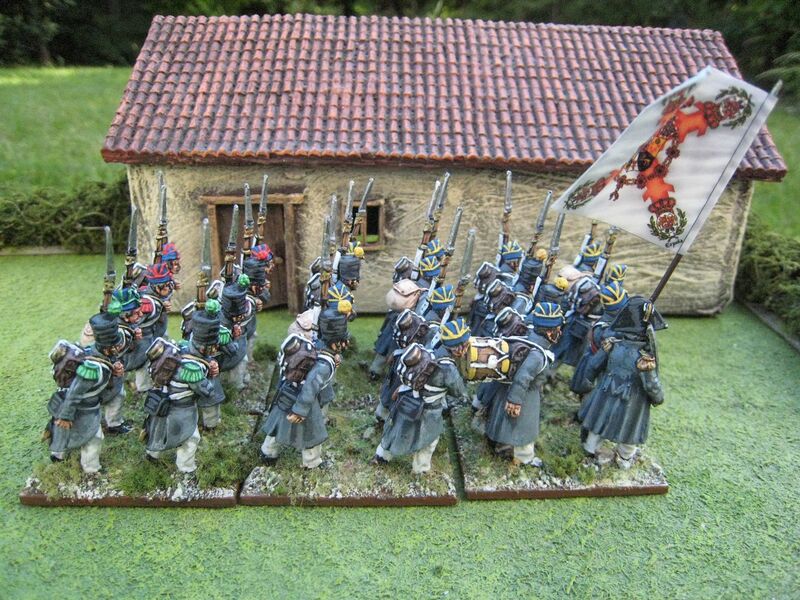 Information on the precise orders of battle for Carlist War battles is hard to come by and, in any event, are there are no distinctions between the regiments that I can discern it doesn't really matter which units one fields on the table. 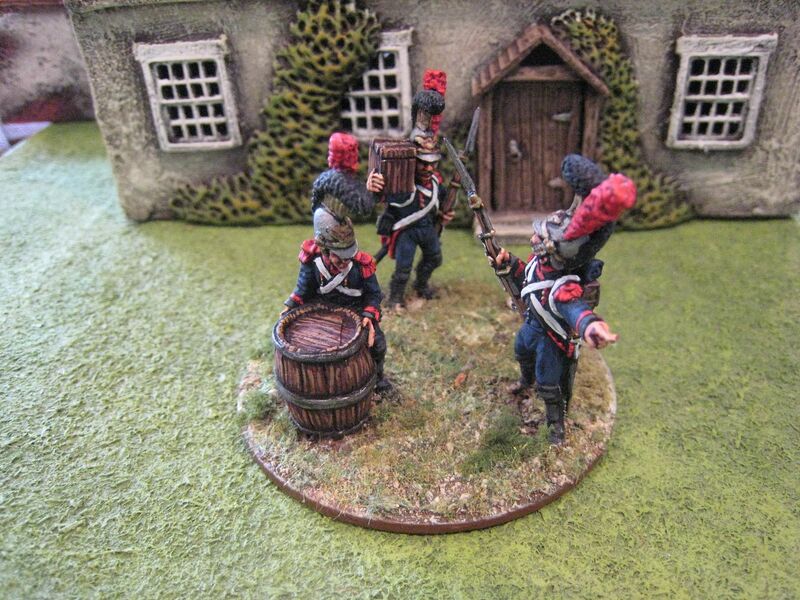 A scenario needs three battalions from the Princesa Regiment? Well, I have two already and I'll field the la Constitution Regt as the third; no one's going to complain. 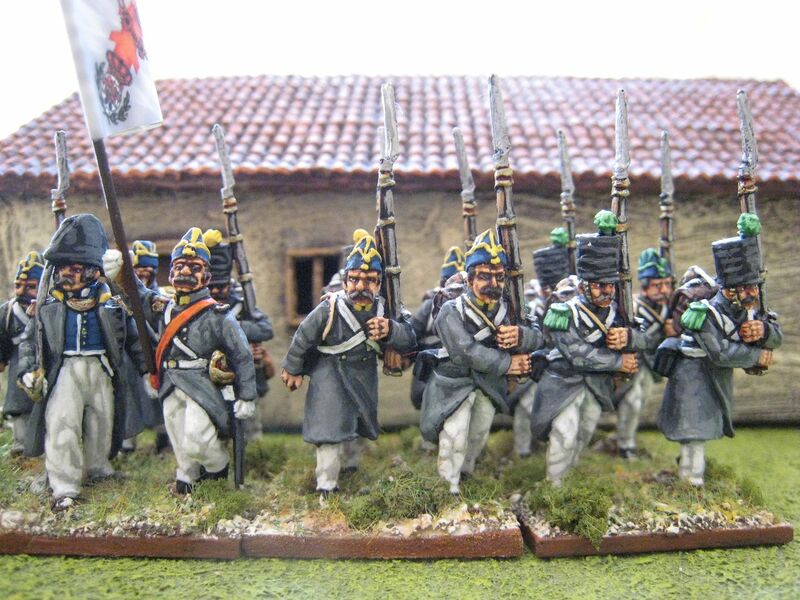 I do try to make each regiment look a bit different. The standard winter uniform for regular infantry was dark grey overcoats and trousers - I painted the La Constitution regiment like that. 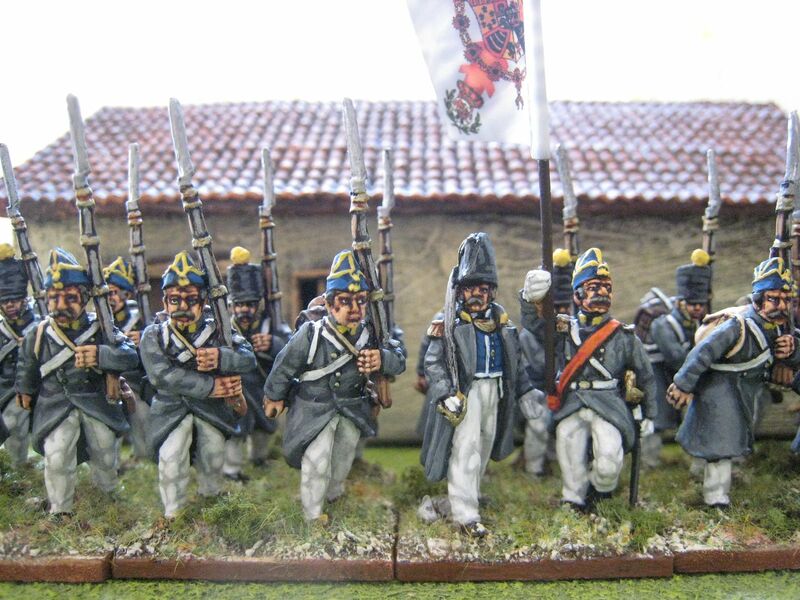 But to make the Espana look different I gave the figures white summer trousers instead of grey ones and didn't add any mud splatter (which I gave to the Borbon Regiment which is otherwise similarly dressed). If I ever get around to painting second battalions for these regiments I will continue the colour schemes of their first battalions. 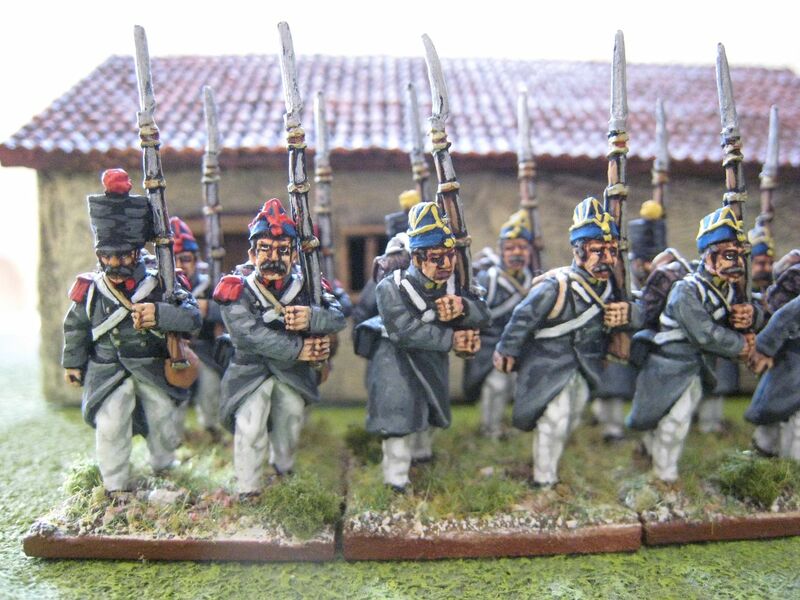 I don't as yet have any light infantry battalions for the Isabelinos, but with 6 regular line battalions and 4 other units, together with the British and French allied forces, I have enough loyalist troops for the moment. 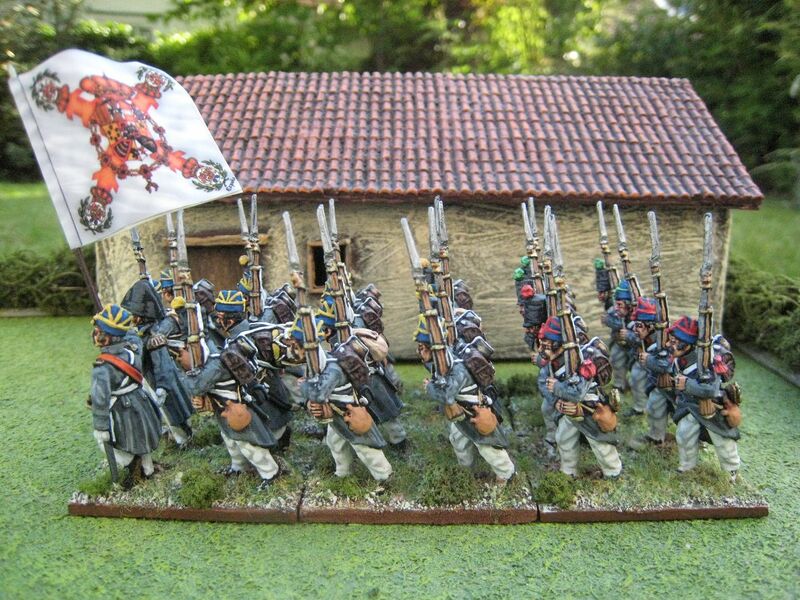 In time I'd like to add second battalions to the Espana and La Constitution regiments and a third battalion to the Princessa. 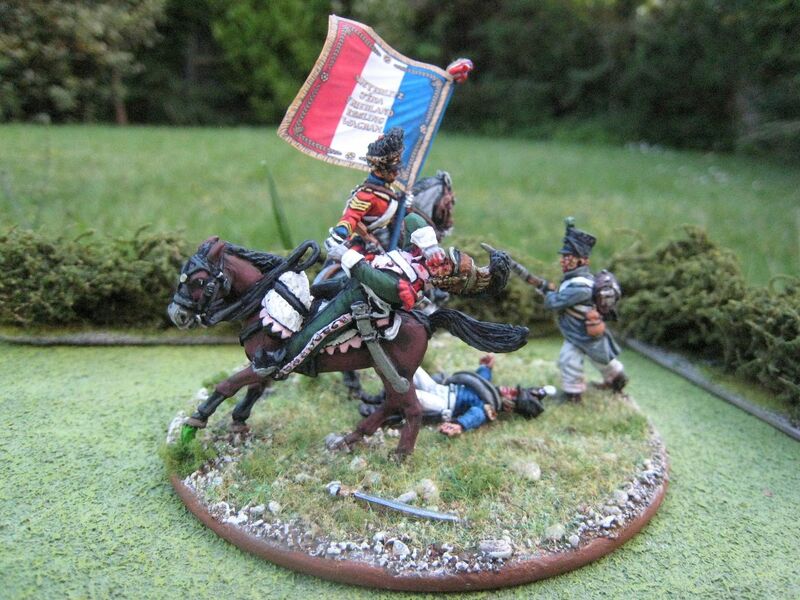 However, in the meantime my Carlist forces need building up, as I only have 3 battalions and some skirmishers. 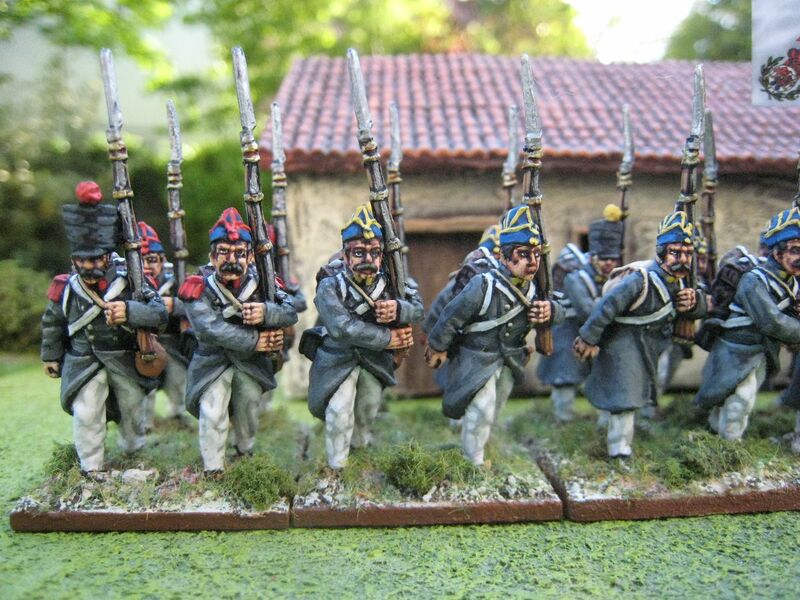 Next up on the blog are 4 new American infantry battalions for the AWI; then more 1815. 24 figures. Painted December 2014-February 2015. Flag by Adolfo Ramos and barn by Touching History. 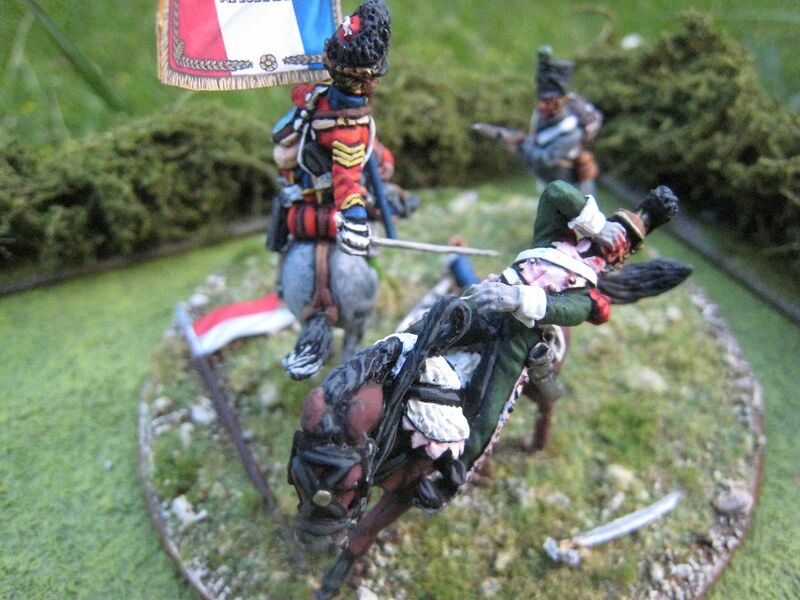 "It was in the first charge I took the eagle from the enemy: he and I had a hard contest for it; he made a thrust at my groin, I parried it off and cut him down through the head. After this a lancer came at me; I threw the lance off by my right side, and cut him through the chin and upward through the teeth. Next, a foot-soldier fired at me and charged me with his bayonet, which I also had the good luck to parry, and then I cut him down through the head; thus ended the contest. 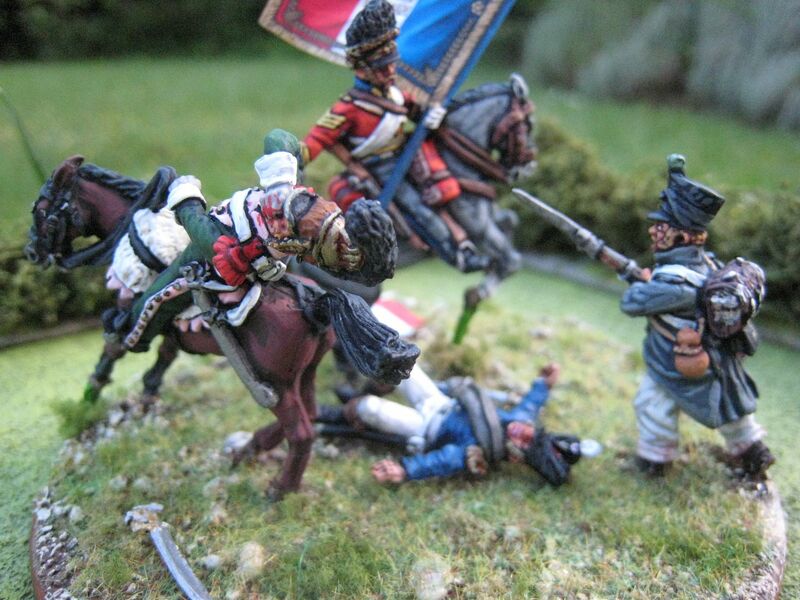 As I was about to follow my regiment, the general [General Ponsonby] said,’My brave fellow, take that to the rear; you have done enough till you get quit of it’. which I was obliged to do, but with great reluctance. I retired to a height, and stood there for upwards of an hour, which gave a general view of the field, but I cannot express the horrors I beheld. The bodies of my brave comrades were lying so thick upon the field that it was scarcely possible to pass, and horses innumerable. I took the eagle into Brussels amid the acclamations of thousands of spectators who saw it." 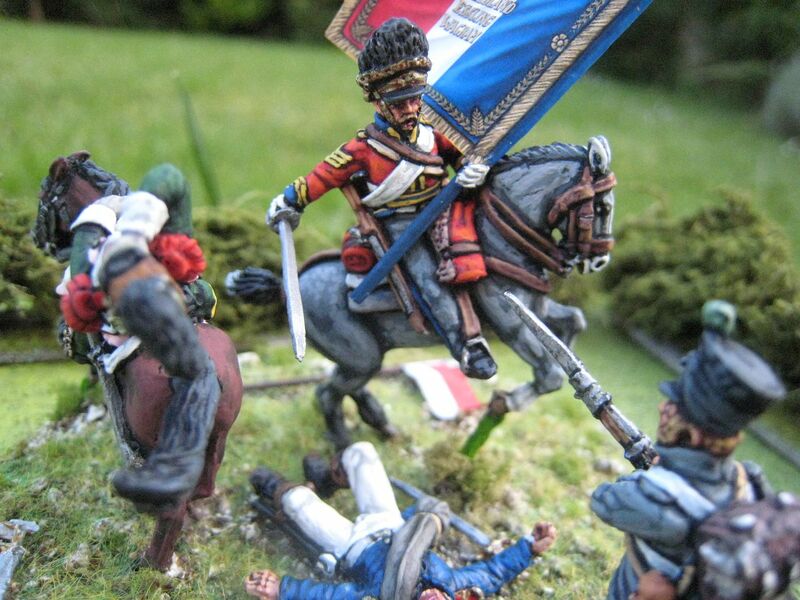 The Scots Greys remained with the occupying forces in until 1816 and early that year he was promoted to Ensign in the 5th Royal Veteran Battalion. Ewart, who was in his mid-forties at Waterloo, retired from the army when his regiment was disbanded later in 1816 (the Royal Veteran Battalions were raised after1802 with men who were considered no longer fit for active duty but who could act as garrison troops; most were disbanded in 1814 but were then re-raised before final disbandment in 1816). Ewart seems to have spent his time as a fencing instructor and giving after-dinner speeches. He died in 1846, at the age of 77. In 1936 his remains were discovered in Manchester and were then reinterred at Edinburgh Castle, where the Scots Greys' regimental museum is located. This set is a bit fiddly to put together. Ewart's left hand is attached to the separate eagle/flag pole and I noticed immediately that there wasn't enough space between the hand and the eagle to accommodate my GMB flag. So I had to cut the pole in half and add some metal rod to lengthen the pole. I then realised that the flag was too big to sit over Ewart's left shoulder, as it appears on the Perry website, so I re-positioned the flag pole to sit across Ewart's body, which has the advantage of plaing the flag itself more "centre stage", I think (I have no idea how the chap who painted the set on the website did the flag - I'd love to know). 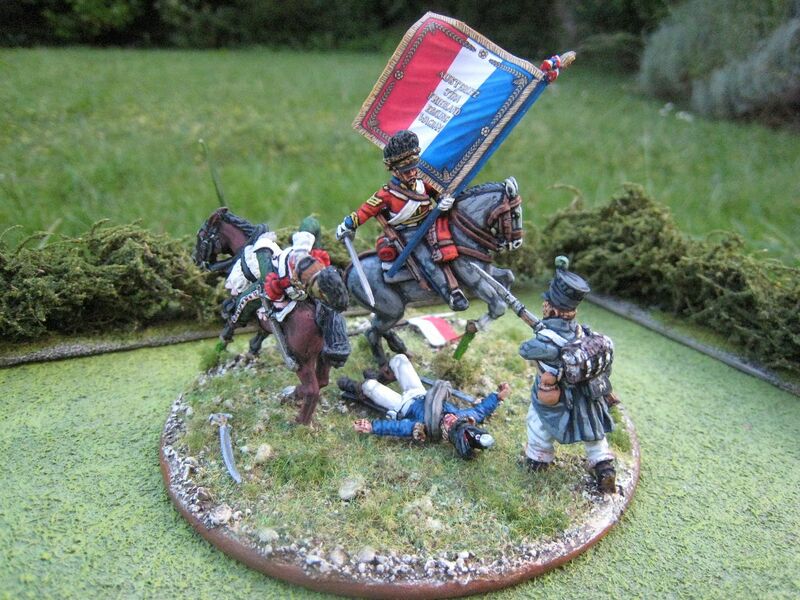 It was only after I'd started painting the figures that I realised that what I had thought was Ewart's sword (the blade isn't attached to the Ewart figure) was actually the French lancer's dropped sword...so where was Ewart's? It then occured to me that what I had thrown away assuming it was a bit of flash on the sprue that held the lancer's sword and lance was in fact the missing sword blade; so I had to rummage around in the kitchen bin to find it! Once the figures were painted I had several goes at positioning them on the base. I think the set is better suited to a rectangular base than a round one, as there isn't quite enough space for the lancer to go past Ewart. 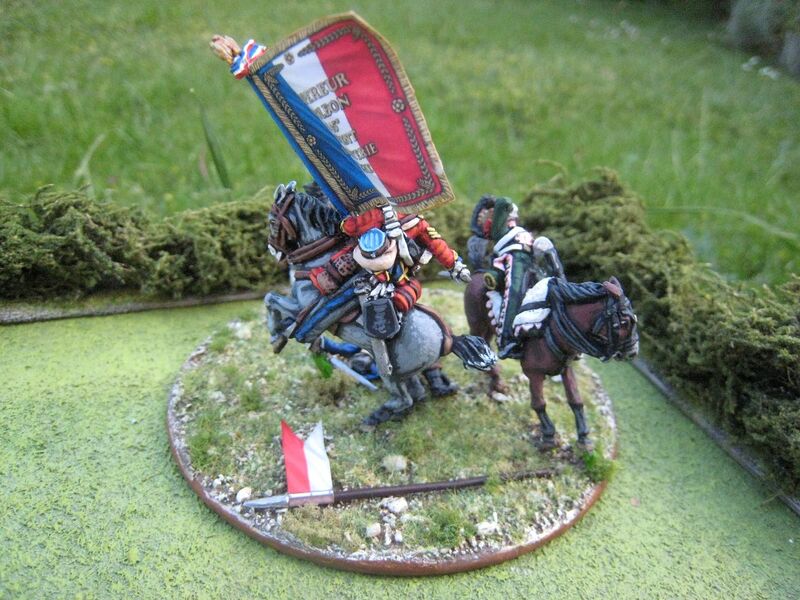 The lancer, incidentally, is from the 3rd regiment of line lancers. 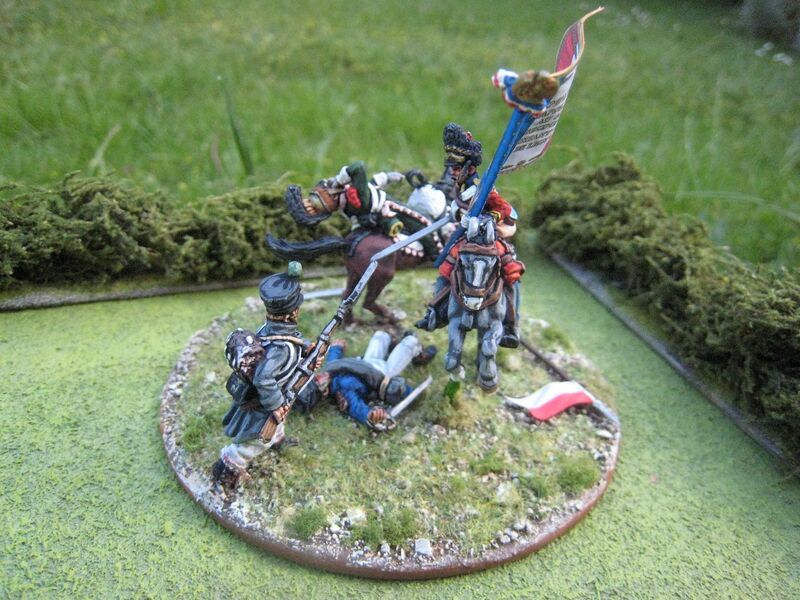 The French cavalry counter-attack against the Union Brigade's charge included the 3rd and 4th lancers from Jaquinot's 1st Cavalry Division. I chose the 3rd because I preferred their pink facings to the crimson of the 4th. The lance pennant is from Adolfo Ramos. It was only once I'd taken these photos that I realised Ewart's sword is looking rather clean and bloodless, so I'll need to rectify that this evening. 4 figures. Painted May 2015. Flag by GMB.